The Thai Gem and Jewelry Traders Association (TGJTA) recently proudly unveilled the Thailand Gems & Jewelry Fair 2016, to be held from September 7 to 11, 2016 at Impact Muang Thong Thani, Bangkok. The Thai Gem and Jewelry Traders Association (TGJTA) was established with the aim of supporting and promoting Thailand’s gem and jewelry industry. The industry is ranked third within the country in terms of export value, generating 371 billion baht (US$10.6 billion) worth of exports in 2015. Part of the TGJTA’s strategy is to support and promote the kingdom’s gem and jewelry industry alongside tourism, through encouraging visitors to take gems and jewelry back to their home countries at the end of their visit. Mr Suttipong Damrongsakul, President of the TGJTA, stated that Thailand’s gem and jewelry export is ranked third in Asia. The industry makes a substantial contribution to the country’s economy through the employment it generates and its high value-added content. It is also considered a “green” industry. 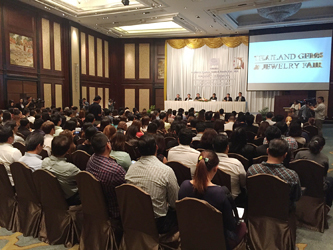 The TGJTA is determined to encourage companies involved in Thailand’s gem and jewelry industry to become more competitive, and it greatly appreciates government support to increase private sector competitiveness. 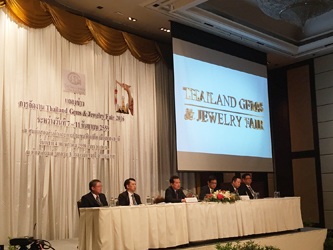 For 2016, the TGJTA believes that Thailand’s gem and jewelry industry should focus on six core areas: building up more skilled workers and designers; addressing the shortage of upstream import materials; establishing new markets; amending laws to support the industry; encouraging the development of new technology and new products; and providing assistance for SMEs to access financial support. The Thailand Gems and Jewelry Fair will be open to both Thai and international companies as well as the general public. Held over an area of 60,000sqm, it will consist of 3,000 booths featuring companies from all over the world. The organisers expect that over 30,000 visitors will participate at the event. The directors and staff of the TGJTA, as well as its network of affiliates, have over 30 years’ experience in organizing successful international gem and jewelry fairs. 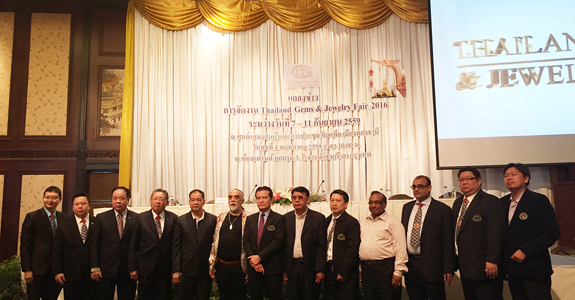 The Thailand Gems & Jewelry Fair 2016 has received favourable feedback from exhibitors. It provides a great opportunity for those companies looking to enter the industry or expand overseas. The fair reinforces Thailand’s strong potential in developing its gem and jewelry products into oversea markets.